I have experimented with homemade self care and home care products for some years now and there are some methods and products and uses that I have perfected for my liking and have become a part of routine in my home. Soap nut use comes to mind first and foremost, I adore their versatility, pure naturalness and affordability. I use them to do laundry with essential oils, pop a handful into clean reused foaming hand soap dispensers and top up with water and a few drops of essential oil for antibacterial action and fragrance for an instant hand soap, and I boil them up to make cleaning solution for every single surface in my home. I even use them to bathe my animals when the need arises and I could go on. 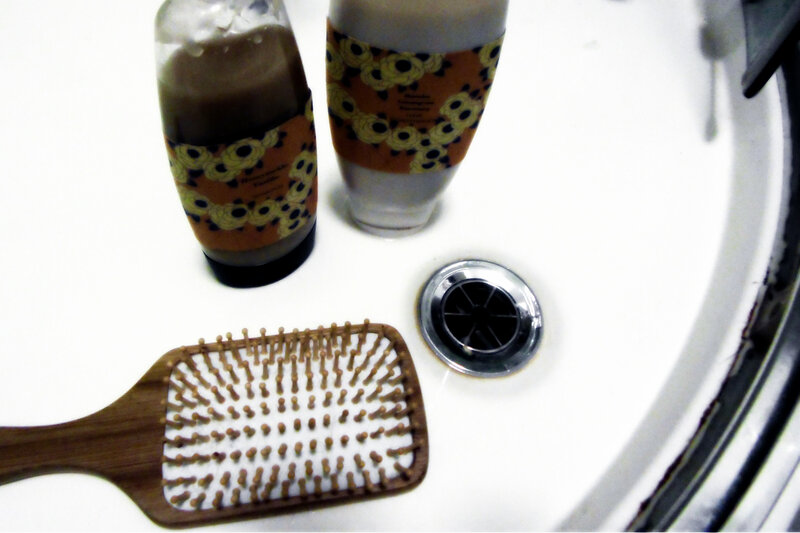 I’ve also used soapnuts to wash my hair countless times, along with other concoctions such as bicarbonate of soda and water, castile soap mixtures, lemon juice and salt, coconut milk and diluted vinegar. Whilst all have cleaned my hair and had their particular benefits, none have become that regular product and I have mostly remained buying in natural, vegan shampoo and conditioner such as Lush or Organic Surge brands. Recently, I started to think about why, when pretty much every other product I had tried homemade had stuck, was I unable to switch to homemade hair care products? 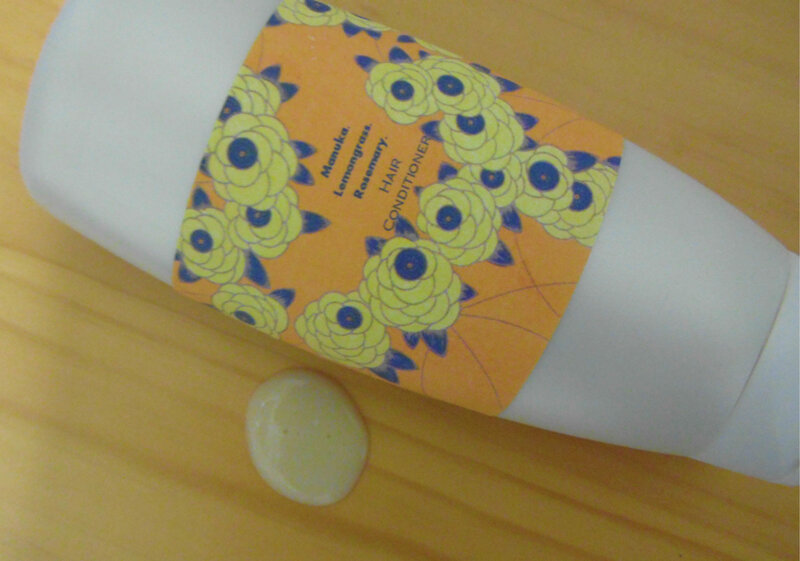 Then it dawned on me, I am accustomed to a convenient, squeezy bottle with a gel shampoo and a creamy conditioner. I don’t always have the time or bother to get out the measuring spoons and supplies before I shower and these solutions were not the kind that stored well. So, I got to work in creating a shampoo and conditioner that is simple to make, great for your hair and customisable to your hair needs, cheap as chips and with that all important consistency that we know and love. Will make your hair feel super clean without stripping natural oils, soothing oats will also gently cleanse the scalp and your chosen blend of essential oils will aid your hair type – think citrus for oily hair, tea tree and lavender for dandruff or itchy scalp and floral or herb oils for normal hair. Mix the chosen liquid, oat flour and starch in a small saucepan and place over a low-medium heat. Stir constantly with a rubber spatula to get to the edges, until thickened to a light gel, about 5 minutes. Transfer to a jug and leave to cool before stirring in the bicarbonate of soda and essential oils and transferring to a re-purposed shampoo container. Creamy and moisture rich yet light and won’t weigh your hair down with the perfect ingredient to seal your hair and make it super soft and shiny. I promise the vinegar does not make your hair smell! If using the dried rosemary, leave to infuse in the vinegar preferably overnight. Skip this step if using rosemary oil instead. Mix the chosen liquids, oat flour and starch in a small saucepan and place over a low-medium heat. Stir constantly with a rubber spatula to get to the edges, until thickened to a thick cream, about 5 minutes. Transfer to a jug and leave to cool before stirring in the vinegar (strained of rosemary if using) and essential oils and transferring to a re-purposed container. This entry was posted in DIY, vegan and tagged allergy free, beauty, crafts, cruelty free, DIY, eco friendly, haircare, natural, vegan, vegetarian. Bookmark the permalink. Thank you for this! I’ve been washing my hair with baking soda and rinsing with vinegar, and while I love the result I would love an easier method. I will give this a try soon!! Of course people can react differently to products however the ingredients are natural, non toxic and gentle so it is highly unlikely. These are great! 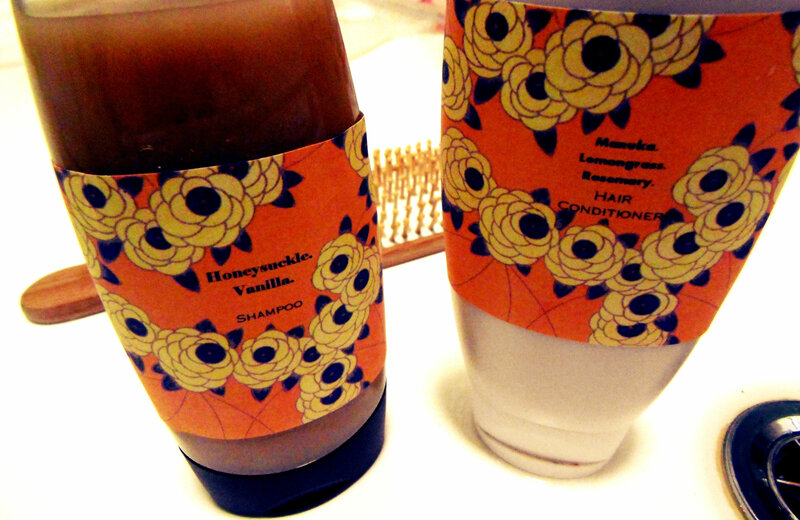 I too have tried a variety of homemade shampoos and conditioners but I end up going back to storebought stuff. Will give your recipes a go – can’t wait! How long do you think these will last for before going off? Kyra I use them up within a week or two since I have a lot of long hair so I don’t know how long they will last beyond that. However since the mixture is cooked and the essential oils are preservatives I can’t imagine they will go bad for a fair amount of time. Also this is why it is important not to use plain tap water as that may go bad sooner. I must try the shampoo, Poppy! I’ve been using ACV or baking soda, but I would love something fragrant but not artificial or damaging. Amazing!!!!! 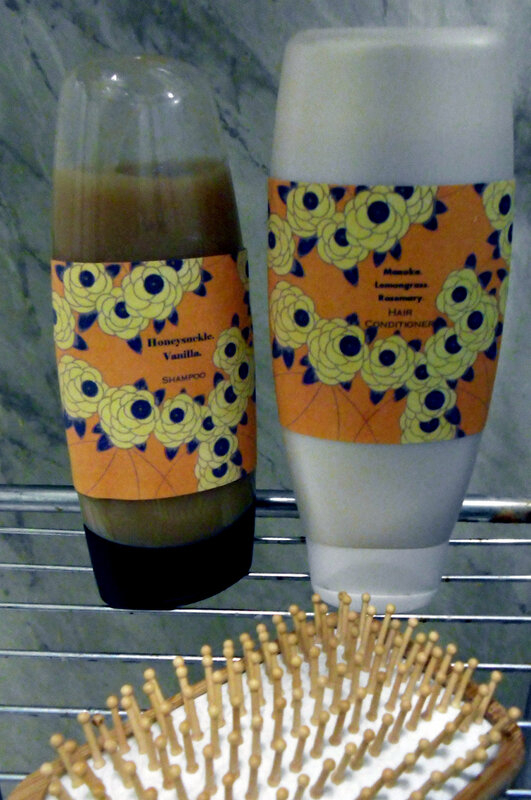 I just bought a new bottle of Acure Organics shampoo, but I’m sooooo trying your recipe when that bottle is finished! 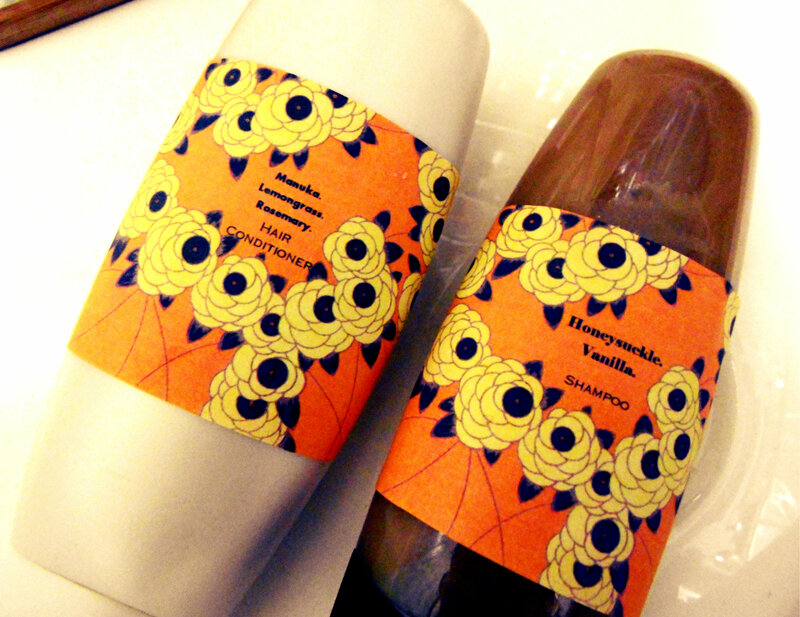 I’ve made homemade shampoos before and none of them were just right. 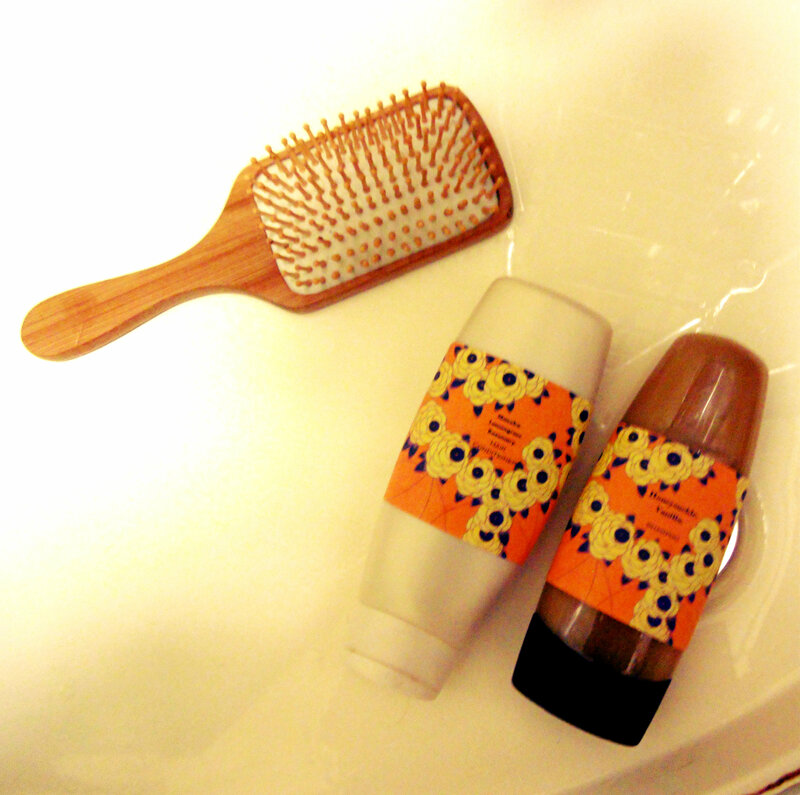 Castile soap based shampoos made my hair feel sort of stiff and dull. And they were too runny! I’m so excited to try this, Poppy! Thank you for sharing it! Thank you for the recommendation! I’ll tell you when I try your recipe!! Have you ever made these recipes in bulk and freezed? Wondering if it’s possible. I haven’t! I will try that though! I can’t wait for my shampoo and conditioner to run out so I can try !!!! It already has starch in it. The purpose of the oat flour is to slightly thicken more but mainly for its gentle moisturising properties. I haven’t made it without oat flour but I’m guessing it may be only slightly less thick so I’d recommend to add an extra teaspoon or so of the starch in the recipe or if you prefer try a teaspoon of coconut flour. HI, I actually tried coconut flour with apple cider vinegar, water, and essential oils. The coconut flour turns this into a shampoo “scrub.” I gently massaged it on my roots only. I do have to admit that it is hard removing it from your hair. I did an apple cider vinegar water rinse after that. I realize this is a year old and comments are about that too, thoughts from anyone who has been doing this? Has anyone frozen it? I like that it’s a smaller amount so you aren’t making enough for a small village, in case you hate it. Any new thoughts a year later? Hi, i have noticed that the shampoo recipe does not include any castile soap or similar, does it work them more like a cream, anyone has tried adding castile soap? can we do so? It is like a gel. I haven’t tried using castile soap so can’t vouch for the result. It is unnecessary unless you must have suds. Hope that helps. I just made this today and was excited to try it. I ran into a couple problems and now I have questions LOL. First, how do you use a cream shampoo? I’m used to rubbing a sudsy shampoo into my hands then distributing it through my hair with lather. Obviously this does not lather/suds so I opted to distribute through my roots/scalp. Is there a better option? Second, I thought I mixed my ingredients well but my hair was littered with tiny particles of ingredients that were obviously not mixed in. Do you think a whirl in a food processor would help? I’d hate to heat it now that essential oils are in it. Anyone have any opinions or advice for me? I need some help please!! My shampoo has littered my hair with tiny flecks of unmixed powders-would a whirl in a good processor help? I don’t want to heat it again now that my EOs are included. Also, how does one properly use a cream shampoo? I only know how to lather commercial shampoo all over LOL. I’m sorry to hear you have had some setbacks with your shampoo! It’s a shame your ingredients weren’t mixed together fully but it really isn’t the end of the world as it will all get mixed into your hair to do it’s job. You coud try a whirl in a processor for sure, but I haven’t tried this, I don’t know if it will froth or the structure will change. Personally I would leave it and maybe use the processor before heating in your next batch? As for use, simply rub into your hair as you would a sudsy shampoo. Just because you can’t see suds, it is still working it’s magic and rubbing it all over your hair as you would regular shampoo will ensure all your hair is covered with the goodness. I hope this helps but please feel free to come back to me if you have any firther questions! I used less water (1 cup), the same amount of oat flour, two tbsp of arrowroot, and strained with sifter when pouring into separate container. Thanks for your tips JSH – did you only use water and not any milk? Does this need to be refrigerated? Thanks!! I don’t refrigerate it but you can if you prefer. What is the ph level of this shampoo and conditioner? It’s important it stays at a level that isn’t damaging to the hair. I tried both these recipes. The shampoo works well, but the conditioner left my hair very greasy. Sorry to hear the conditioner didn’t work well for your hair. It is strange as it isn’t oily. Did you use the essential oils in it? You could try adding more vinegar to aid degreasing. Try using the conditioner first then the shampoo. I have very oily hair and I switch it up and it came out great. I use 1tbsp of grapeseed oil instead of coconut milk. If you have oily hair the cocnut milk just adds to it. So replace the milk with water and add 1 tbsp of grapeseed oil & 1tbsp extra of ACV. OMG….THANK YOU,THANK YOU! I started no-poo about 4 months ago. 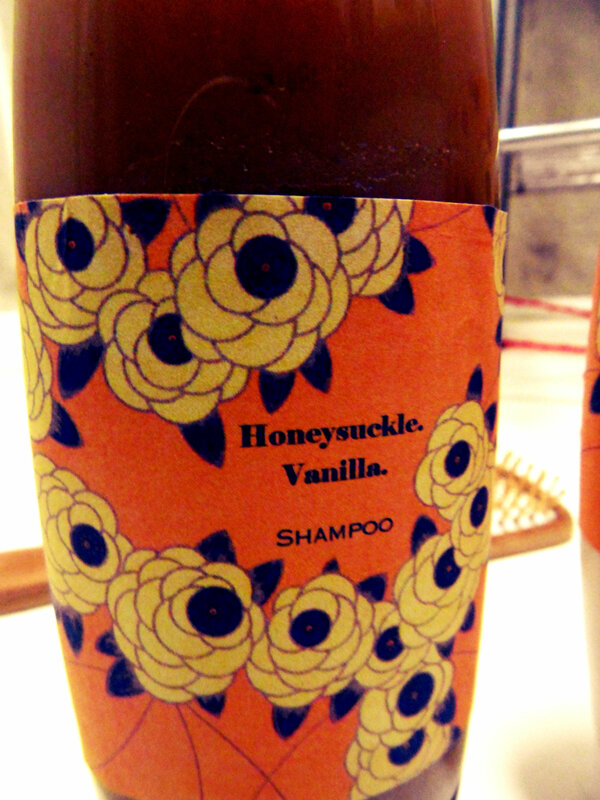 I have tried like tons of shampoo recipes. I have very oily hair and everything just made my hair oilier. It like the transition stage was never ending. I came across your recipe a couple weeks ago and was a little unsure. Well, I gave in last night and tried it. I love how it feels more like shampoo and conditioner. Not sure if it’s the arrowroot powder or what that helps keep my hair less oily. But it seems to help a lot. I still have a bit of oiliness but way less then before. So has time goes by I’m looking forward to using it. Thank again! Where do you get your honeysuckle essential oil? 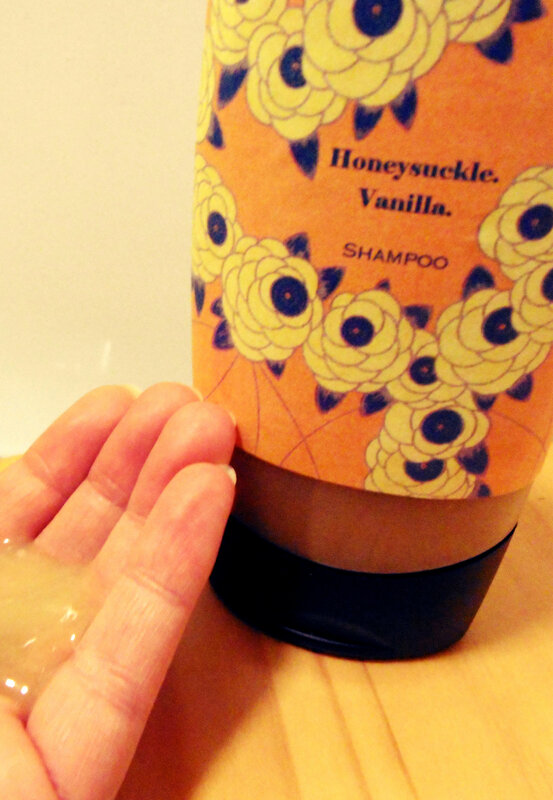 I love the smell of honeysuckle, but have never been able to find the oil. Hi Kirstin, I get mine from Anglesey organics who has an ebay store. Great quality and prices and organic. Thank you thank you thank you for these,I am so🙆🤗 I’ve been looking for the gelatinous ingredients which I have arrow root now that you mention it & I start think🤔, I was wondering Chia seeds. I use infusions to wash my hair and I wanted to keep them in longer like a mask I think this will work. I hate to waste anything, so if I can leave an infusion longer it won’t feel so bad running down the drain. Christine, what a bright and happy message! That really made me smile. Belated birthday wishes, I wonder if you made the cake? I really loved this shampoo, but I’m just worried about if it wont go bad if it takes a few weeks till you used all of it. Or if you should keep it in the fridge or something. Hi Belle, I’ve not had any issues with it going bad and generally use it in a couple of weeks but you can keep it in the fridge if you want to be sure. I haven’t tried adding those but I don’t see why not! It’s a base recipe for you to add whatever you like 🙂 glad you loved it!